Nearest weather station, with distance and direction from RNA: The nearest weather station is at Mt. Ida, AR, 24 miles to the northeast. Annual precipitation (type, seasonal distribution): The annual precipitation is 54 in, and the length of the record is 67 years. Maximum and minimum temperatures: The average temperature is 60°F, the lowest temperature is 10°F, and the highest is 99°F. The length of the record is 67 years. Elevation: 1300 – 200 ft.
Geology and Soils: The mountains are made up of black and gray folded novaculite with a few thin beds of black shale and some slate. Chert and breccia also occur. This area is similar to all of the Ouachita Mountains. The RNA drops over 600 feet in elevation from one end to the other. Slopes of 60 to 100 percent and elevation increases of approximately 500 ft extend from the valley bottom to the ridges on both sides. Aquatic Features: The RNA includes the upper part of the Roaring Branch watershed. Roaring Branch is fed by numerous springs and flows year round, even during droughts. 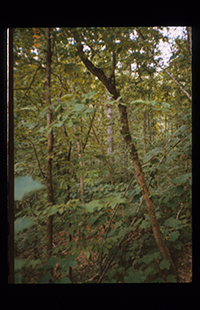 Plant Communities: The RNA includes old growth hardwoods and shortleaf pine (Pinus echinata), possibly virgin stands. In addition to the shortleaf pine on the south–facing slope and white and red oaks (Quercus spp. and hickory trees (Carya spp. ), on both lower slopes a mixture of black gum (Nyssa sylvatica), sweetgum (Liquidambar styraciflua), beech (Fagus grandifolia) and basswood (Tilia americana) occurs. Ironwood (Carpinus caroliniana), black walnut (Juglans nigra), black locust (Robinia pseudoacacia), holly (Ilex opaca), witch hazel (Hamamelis virginiana), chinkapin (Castanea ozarkensis), dogwood (Cornus florida) and redbud (Cercis canadensis) occur along the stream bottom. Trees are quite large, due to the inaccessability of the site. At Risk Species: Rattlesnake plantain (Goodyera pubescens), Streptanthus maculatus, Indian cucumberroot (Medeola virginiana), and wake robin (Trillium sp.) are listed as threatened by the Arkansas Dept. of Planning. Common Shrub Species: Lowbush blueberry (Vaccinium vacillans) and witch–hazel were abundant in the shrub layer. Common Herbaceous Species: Forty-three herbaceous species were identified in the RNA. Several panic grasses (Panicum spp. ), poverty grass (Danthonia spicata) and several Desmodium spp. are frequent. Common Mammal Species: Few animals were observed during visits to the RNA; a raccoon (Procyon lotor) was seen and there was evidence of feral hogs (Sus scrofa). Other: Copperhead snakes are common. Fountain, M. and Sweeney, J.M. 1981. Ecological Assessment of the Roaring Branch Research Natural Area. USDA Forest Service Southern Forest Experiment Station Research Paper (213). 13 p.
The Nature Conservancy, Arkansas Field Office. 1999. 1998 Reassessment of Roaring Branch Research Natural Area. The Nature Conservancy, Little Rock, AR. Unpublished Report, 36 pp.